Bored with the West Hollywood gay scene, best friends Michael, Johnny and Ted have embarked on a cross-country road trip from LA to New York City. Though their friendship hits a few speed bumps along the way, the trio decides to have one last hurrah during their final night on the road. That's when fate brings them to the Lion's Den, a secluded backwoods bar where not everything is as it seems. As the three out-of-towners toast the end of their journey, someone at the bar is watching them and setting a deadly trap. Now, as closing time draws near, a night of unspeakable horrors is about to begin. . .
Jesse Archer (Violet Tendencies, Going Down in LA-LA Land) and Ronnie Kroell (Eating Out: Drama Camp, Bravo's Make Me a Super Model) headline in this bold, uncompromising thriller that plunges into the depths of human depravity. 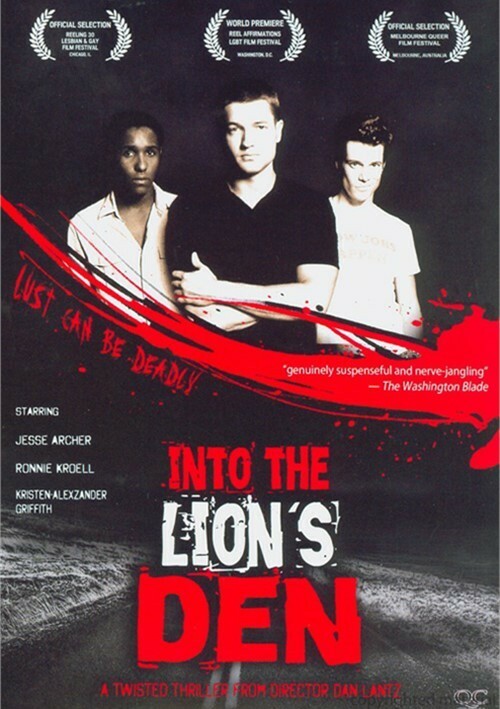 With its unpredictable plotline and raw performances, Into the Lion's Den is a twisted nightmare that viewers won't soon forget. A good premise that got lost in the details. Cliche-ridden and not enough eye-candy to begin to compensate for the plot.